People from some cultures may do business or assimilate into mainstream US culture much more easily than others. Despite historical differences with Imperialist Japan as the 'Axis' nation which bombed Pearl Harbor in 1941 and drew the US into World War II, Japanese have successfully sold electronics, computers, and many other products in the US. Many Japanese interpersonal issues also are important in the US. Japanese products have a good reputation for reliability at an affordable price. 'Taijin kyofu sho' describes an individual's intense fear that his or her body may displease others in appearance, odor, facial expression, or movements. These concerns, shared in the US, have helped to build the modern US personal hygiene industry of soaps, deodorants, lotions, and other products. These more rational ethnic personal and interpersonal concerns are adaptive and economically useful in business and trade. Other cross-cultural issues may be irrational and disruptive. 'Lat ah' is known in Japan and in Indonesia, Malaysia, the Philippine Islands, and Russia's Siberia. 'Lat ah' involves dissociation or trances. 'Lat ah' complaints are consistent with US and European descriptions of schizophrenia and other thought disorders, often exhibited behaviorally. The 'lat ah' may complain of a hypersensitivity to their surroundings, then sudden fright, often accompanied by repetitive, stereotyped behaviors like 'rocking', cursing, and often describes their behaviors as being ordered by an inner voice as in 'command obedience' or a 'command phantasy'. Found with increased frequency in middle-aged women, a woman may physically or verbally abuse her child stating she had been told to do so. In India, 'dhat' is severe anxiety, body discomfort, weakness, exhaustion. 'Dhat' is similar to 'sukra prameba' in Sri Lanka, and 'shon-k'-rui' in China. Koreans exhibit 'hwa-byung', suppressed anger syndrome. Complaints may include difficulty sleeping, fatigue, panic, fear of impending death, unhappiness, indigestion, eating disorders, sometimes complaints of a mass in the stomach. 'Shin-bying' includes anxiety and complaints of body discomfort with a sense of being possessed by ancestral spirits. Similarly, Native American Indians complain of 'ghost sickness' with thoughts of death, deceased relatives or friends, bad dreams, body discomfort like suffocating, feelings of futility, confusion, hallucination and sometimes loss of consciousness. 'Zar' in Ethiopia, Somalia, North Africa, Egypt, the Sudan, Iran, and elsewhere in the Middle East, is the experience of spirits possessing the individual, with shouting, laughing, hitting head against a wall, singing or weeping. These hyperactive events may be followed by apathy or withdrawal, loss of interest in eating and usual life activities. Current US internationalist politics and policies require much more interaction with individuals and tribes from other cultures, who exhibit many of these beliefs and behaviors. Larger immigrant populations in the US and US military and development personnel presence in war zones in these regions, influence more Americans than ever before. Being culturally very different, but involved in governmental reorganizations and the internal affairs of other cultures because of business interests vastly increases the risk of more spontaneous, irrational violence, in war zones or in development projects. New immigrants to the US, some refugees from war-torn countries, and returning US soldiers, exhibit exotic symptoms and expand the social-welfare industry. Not only are there new psychiatric syndromes. There are increased requests for monthly disability checks from US governments and hiring preferences in a US economy already challenged by high unemployment. Email mkrause381@gmail.com or mkrause54@yahoo.com to comment or request a copy of this or other blogs posted by mary for monthlynotesstaff on http://monthlynotes22.blogspot.com (http://monthlynotes.blogpsot.com through '22') on www.google.com. See http://monthlynotes18.blogspot.com or '19' for bloglist titles and URLs. Reference: DSM-IV (Diagnostic and Statistical Manual of Mental Disorders, Fourth Edition, Ed. Allen Frances, MD, Chairperson, Robert L. Spitzer, MD, Special Advisor American Psychiatric Association, Washington, DC, 1994. 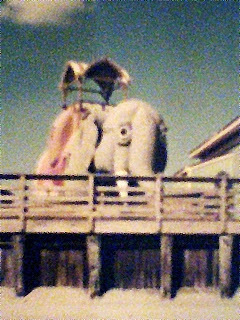 Graphic: An Original Photographic of "'Lucy the Elephant', on the Atlantic Beach, Near Atlantic City, NJ, 2003. ', copyright, mkrause381gmail.com or mkrause54@yahoo.com. Dramatic increases in immigration from exotic, non-North Atlantic, non-British, non-European, countries have created intracultural stresses and strains in US society. Psychiatry has not been immune to these other-cultural influences. Standardized scales of psychiatric diagnosis, also used as sources of medical insurance billing codes, DSM-IV ('Diagnostic and Statistical Manual-4th Edition') and ICD (International Code of Diagnosis) now include descriptions of exotic culture syndromes and symptoms. Dissociative Disorders, previously psychiatric esoterica, include descriptions of a large number of unusual 'fugue' syndromes. 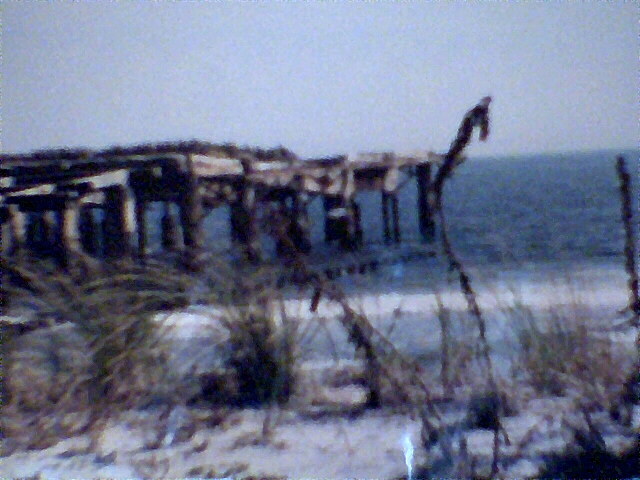 Similar issues, such as travel from their native countries, issues about new or changed identities, and memory problems. Differences in shared cultural understanding of the world arise because of, or as reflected in, differences in language and concepts expressible in the native language vs. the new language, American English, often are not considered in clinical psychiatry. Oddly enough, these issues are sometimes more often raised in TV travel ads: the Islander tells the American there is no word for that in his language, as the Islander sells the American traveller the vacation package. The concept of cultural literacy, common traditions in art, literature, history, philosophy, and the role of 'non-linear' vs. more 'linear', logical forms and expressions of thought also are significant differences cross-culturally. These are many differences between traditional 'Western' vs. 'Eastern' and civilized vs. primitive views of people and the world around them. A classic fugue state in a mainstream US citizen might involve a busy but forgotten trip. Despite airline ticket, hotel, or restaurant receipts or photographs documenting the weekend away, the person in a fugue state does not recall the trip. Fugue states for Americans from exotic locations like the Hawaiian Islands, Alaska, the territory of Puerto Rico, or 'native American tribes' resemble syndromes of new immigrants from tribal culture countries of origin. These fugue-like states, 'Running' syndromes, include 'running amok', found in Western Pacific Islanders. Most well-known of these syndromes in the general American English parlance is 'running amok'. An extremely disorganized company, with employer or employees not doing business as usual, not 'making sense', could be described as 'running amok'. A Pacific Islander might complain of a sudden high level of activity, a trance-like state, potentially dangerous behavior, running or fleeing, followed by exhaustion, a long sleep, or amnesia for the activity. The likelihood of such symptoms increases during times of extremely stressful events, deaths in the family, divorces, war or natural disasters. The person 'running amok' may tell of a period of brooding over some event or feeling about an event, for example after a perceived slight or insult. Then the 'amok' may have an outburst of violent, aggressive, or even homicidal behavior directed at people and objects. Navaho 'tich 'aa'' and 'frenzy' witchcraft and the Arctic native 'pibloktoq are described in indigenous groups in the US, more frequently in men. 'Pibloktoq' in Arctic, sub-Arctic, Alaskan Eskimos too may begin with a withdrawn or irritable state for hours or days. Then abrupt extreme excitement occurs for 30 minutes with tearing off clothing, breaking furniture, shouting obscenities, eating feces, fleeing from protective shelters, or other irrational or dangerous acts. Frequently, after the excitement, there are convulsive seizures, then a comatose state occurs for about 12 hours. Typically, the 'pibloktoq' has no memory of the episode. Similar episodes are self-described as 'falling out' (sic, 'I fell out') or 'blacking out', in the US, particularly in those from Southern US states and among Caribbean descendants. Periods of 'brooding' may or may not precede feelings of 'swimming in the head', lightheadedness or 'dizzyness', and complaints of 'can't see' with eyes open, 'can't hear', 'can't move' without signs of illness or injury. New immigrants have brought new dissociative syndromes. Caribbean Latin American Latinos complain of 'ataque de nervios', with strongly expressed anger or rage, bodily feelings, trembling, uncontrollable shouting, screaming, stomach and bowel disturbances, headache, and even loss of consciousness. Similarly, with 'locura', there may be incoherence, agitation, hallucination, disregard for 'rules of social interaction', with unpredictable, possibly violent behavior. West African students complain of 'brain fag' (sic, fatigue) from 'too much thinking', with difficulty concentrating, remembering, head and neck pain, pressure, tightness, blurred vision, heat or burning sensations. Violent 'borifee dehrante' starts in West Africans and Haitians with a sudden outburst of aggressive behavior, marked confusion, and agitation. 'Susta' or 'soul loss' involves the feeling that the soul leaves the body for days to years. Sickness, unhappiness, even death may occur. Greeks performed ritual healings to call the soul back to the body. The 'Running Syndromes' have complicated psychiatric care and expanded the US 'social-welfare industry'. Many US citizens and new immigrants from other culures and countries of origin may have been taken in to US welfare and disability programs with psychiatric diagnoses. Some may have been diagnosed with personality disorders, some with paranoid schizophrenia, and some in mixed diagnostic categories. Other issues like alcohol, drug abuse, mental retardation/emotionally disturbed/developmental disorders may also be prsent. Some of these disorders are considered compensable disabilities, some are not. US success, domestically and internationally, has depended on more linear, rational codes of behavior promoting productivity at work and control of emotions at work or school, while shopping, and in organized social activities like sports and hobbies. Demands of multicultural groups for 'acceptance', financial and other oompensation for very different, other-culture, more aggressive physical and emotive, behavior patterns have created substantial stresses and strains in US society. Email mkrause381@gmail.com or mkrause54@yahoo.com to comment or request a copy of this or other blogs posted by mary for monthlynotesstaff on http://monthlynotes22.blogspot.com (http://monthlynotes.blogspot.com through '22') on www.google.com. See http://monthlynotes18.blogspot.com or '19' for bloglist titles and URLs. 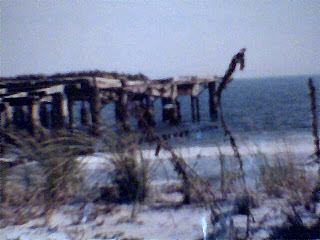 Graphic: An Original Photographic of 'Old Pier On The Atlantic, Atlantic City, NJ, 2003', copyright mkrause381@gmail.com or mkrause54@yahoo.com. Reference: DSM-IV, American Psychiatric Association, Ed. R. Spitzer, et.al. US Democrat Party President Lyndon Baines Johnson (1963-1969) changed the course of American history and society more than he could have imagined, perhaps more than most US historians recognize. LBJ lifted the immigration quotas from Liberty Island in Immigration Reform of 1965. The number of Western hemisphere immigrants to be was accepted was increased to 120,000. One source notes the expected result was a sharp increase in immigrants from Italy, Greece, Poland, and Portugal. More significantly, LBJ increased the number of immigrants to be accepted from the rest of the world to 170,000, with the restriction of 20,000 from any 1 nation. Vice President Johnson's ascent to the Presidency occurred upon the assassination of the 35th President of the US, John Fitzgerald Kennedy. JFK faced significant 'Cold War' issues before his assassination, notably The Cuban Missile Crisis. The reasons for the increased immigration quotas are beyond the scope of this article. But LBJ's 'War on Poverty' was to be expensive. And there has been a traditional Presidential belief that the best way to increase US revenue, 'expand the economy', or 'bail out' a weak economy was to bring new immigrants. The question of whether such new immigrants were rich or poor apparently has not been factored into this White House wisdom. Previously, the theory of immigration quotas rested on the question of which immigrants were most like Americans, who would be easily assimilated into the US 'melting pot'. From the time of the early US Census in 1790, the US population drew mainly from the British, Scottish (Scotch), Irish, Dutch, French, German, with smaller numbers of self-identified Hebrews and Asians. There were populations of American Indians, now termed 'Native Americans'. There were 'mestizo', a mixture of white and Indian, Negroes, and Indes Island indians. Census-takers asked questions of ancestry back to the grandfather. Many 'coloreds' did not supply this information. There were other smaller groups of immigrants. Asians were 'imported' to California to work on the trans-continental railroad in the mid-1800s. Records were clearer, as these immigrants arrived with documents, as displayed in 'The Green Mountain' exhibit at The Smithsonian Institutes in the early 2000s. Terminology changed. The term 'native' in 1900 meant American as opposed to new immigrant. Immigration increased. By 1900, there were about 67 million Whites and 9 million 'coloreds'. LBJ already had achieved his immigration goal. In 1964, 200,000 Mexicans were thought to have arrived in US California from Baja California and other parts of Mexico. Another 50,000 arrived in 1965 as 'green card' workers. Then Cabinet Secretary of Labor Willard Wirtz sought to hire Native Americans before importing Mexican contract workers in 1965. The 'green card' issues were transferred at the Cabinet level to the Secretary of the Department of Agriculture. During this time, Western US high school students created the 'A-TEAM', 'Athletes in Temporary Employment in Agricultural Manpower', to find jobs in migrant farm labor. However, various foreign 'Migrant Aid Bills' were extended through the 1964 anti-poverty bill and subsequent groups of Mexicans and some Canadians were 'imported' for farm labor. The pre-1965 population, largely of Western European origin, shared many of the same cultural traditions in philosophical thought, art, literature, history, ethics and morals, similar mostly Christian religions in a Judeo-Christian timeline, politics, related and proximate languages. Despite the relative homogeneity, there were many disputes. But most probably would understand the questions and answers of the discussion. 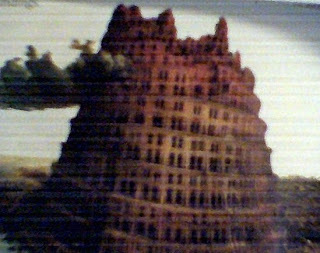 It is arguable that there is a relative 'Tower of Babel' in the US today. Ethnic and racial issues have caused divisiveness and hostilities in American society. Lawsuit settlements threaten to tip over 'the melting pot', as new immigrants come to seek reprisals or reparations, to become 'special interest groups' demanding special and separate funding, rather than to become part of the American way of life. References: 'A Century of Population Growth. From the First Census of the US to the Twelfth, 1790-1900', Bureau of the Census, Bureau of Commerce and Labor, Washington, Government Printing Office, 1909. 'The Who, What & Where of America. Understanding the Census Results', Ed. Martha Farnsworth Ricks and Deirdre A. Gaquin, Bernan Press, Lanham, MD, 2003. Graphic: 'Ancient Tower of Babel', in 'The Illustrated Book of Signs & Symbols', Miranda Bruce-Mitford, A DK Publishing Book, NY, NY: 1996. 'Baby Boomers' who went to college in the 2nd half of the 20th Century will remember the cross-cultural dichotomies presented in early lectures in most liberal arts subject areas. The US was characterized as classical, individual, literate, reasoned, restrained, platonic or sensual, democratic, a part of the great Western Civilization which had led humanity out from the darkness, despair, ignorance, illiteracy, poverty, pestilence, famine of the Dark Ages of the 4th-6th Centuries AD. The US and European Western Civilization was thereby distinguished from the East, exotic, tribal or primitive, pictographic, unrestrained, sexual, arbitrary, dynastic, influenced by China and a succession of Eastern dynasties and dictatorships or disorganized and chaotic. Unfortunately, the West was identified with the 'male' and the other with the 'female', alienating to many women Baby Boomers who went to college to succeed, other than or in addition to achieving the 'MRS. degree'. Now even the terms which describe historical time are being challenged. The Greco-Roman traditions preceding the Holy Roman Empire, Europe, and the Christian roots of Western Civilization are preserved in the letters BC ('Before Christ') and AD ('Anno Domini' or 'Year of Our Lord'). Some scholars seeking to break the Judeo-Christian organizational timeline have proposed the alternate term 'CE', 'Common Era', (also 'Christian Era', or 'Current Era' for 'AD'). sense of pulling such partners too close, too far into the other culture. Each side tries to get a 'better deal' from a friend by utilizing more interpersonal psychological manipulations or techniques. This involves the use of interpersonal techniques, on personal levels in businesses, on national and international levels. The psychological differences among people of different cultures has had a profound influence on US society. These differences influence psychiatry, and the economy which has grown around psychiatry as part of the social-welfare industry. See the next blog in this series for a discussion of these issues. Email mkrause381@gmail.com or mkrause54@yahoo.com to comment or request a copy of this or other blogs posted by mary for monthlynotesstaff on http://monthlynotes22.blogspot.com (http://monthlynotes.blogspot.com though '22'). See http://monthlynotes18.blogspot.com and '19' for bloglist of titles and URLs. 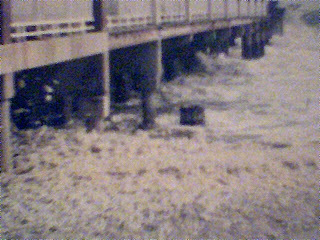 Graphic: An Original Photographic of 'Sea Foam, After Early Winter Storm on the Atlantic Ocean, 15-20 ft waves, winds up to 55 knots', Atlantic City, NJ, November, 2003, copyright mkrause381@gmail.com or mkrause54@yahoo.com. mkrause,2011. Picture Window theme. Powered by Blogger.